I’m having a bit of a love affair with Middle Eastern food at the moment inspired by my purchase of Gillie Basan’s The Middle Eastern Kitchen earlier this week. Though to be honest, I’m always pretty much in love with lovely mezes and other Middle Eastern dishes, which will be known to regular readers of this blog. In fact, one of the very first books I ever commissioned as an editor back in the late 1970s was Middle Eastern Cookery by Robin Howe, who was a leading cookery writer at the time. 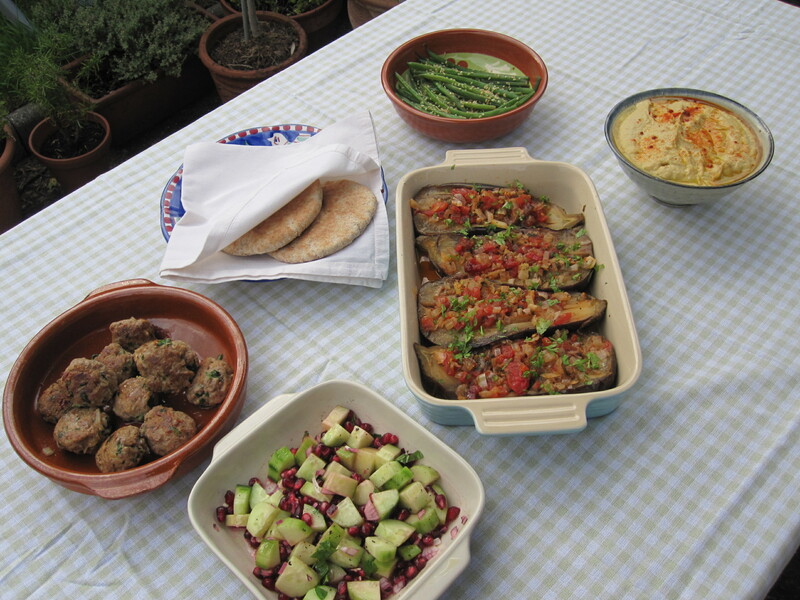 The weather forecast promised sun today and visions of us sitting in the garden in the evening, a blue sky turning into soft pink, and plates of mezzes sitting on the garden table in the still-warm air made me feel that summer had arrived at last. There wasn’t quite as much sun as promised but it was still warm enough to sit outside at suppertime. The great thing about mezes is that you can eat as little or as much as you want and any leftovers will be just as delicious – if not more delicious – the next day. Anything cooked is best served at room temperature so cooking in advance is a bonus. 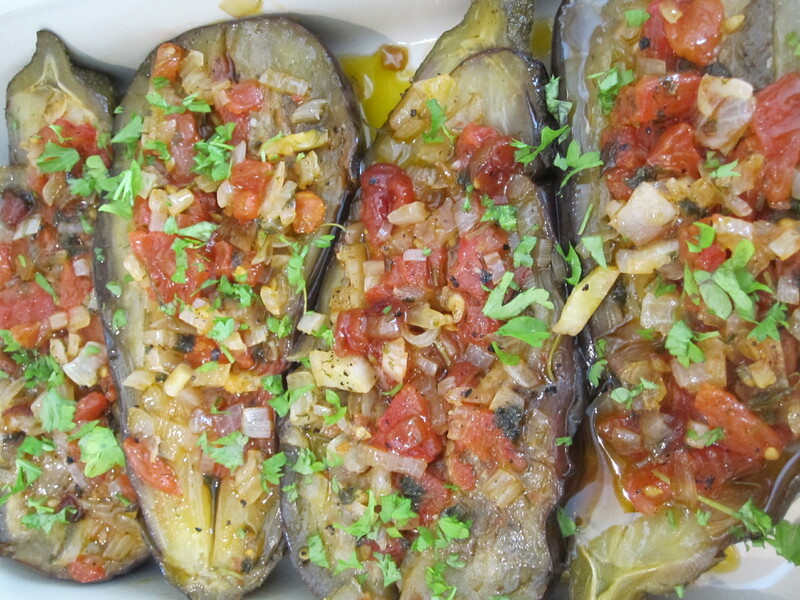 There were a couple of recipes I wanted to try from Gillie Basan’s book: her version of Imam Bayildi (Stuffed aubergines in olive oil) and a Pomegranate and Cucumber Salad. The cucumber salad was more last minute but the Imam Bayildi needed to prepared earlier in the day, to first cook gently for about an hour and then be left to cool to room temperature. The following are pretty much Ghillie’s recipes with slight variations. Finely chop 1 medium onion and 1 clove of garlic. Skin 3 large tomatoes by plunging in boiling water for about 30 seconds first and then chop into smallish pieces. 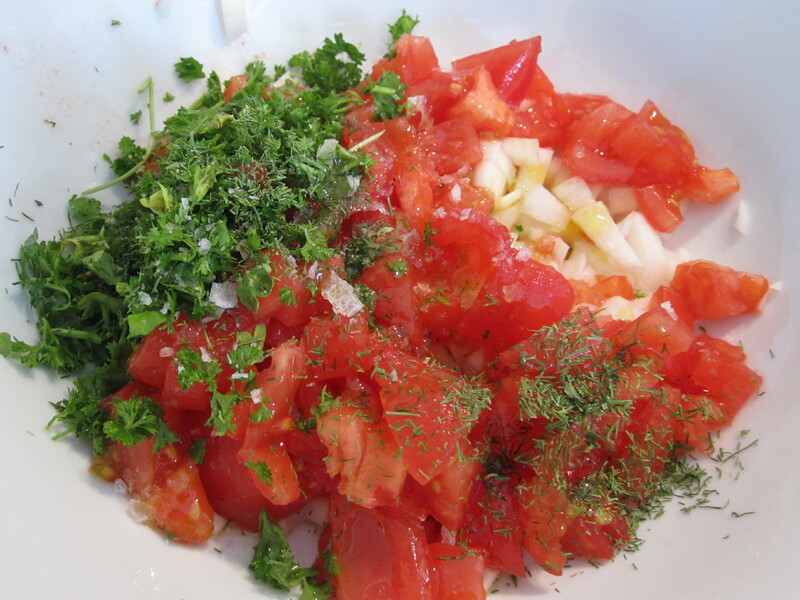 Put the onion, garlic and tomatoes in a bowl with a couple of tablespoons chopped parsley and some chopped fresh dill – if you can get some. I couldn’t and added about 1 teaspoon dried instead. Add salt and freshly ground black pepper and about 1 tablespoon olive oil and mix well. 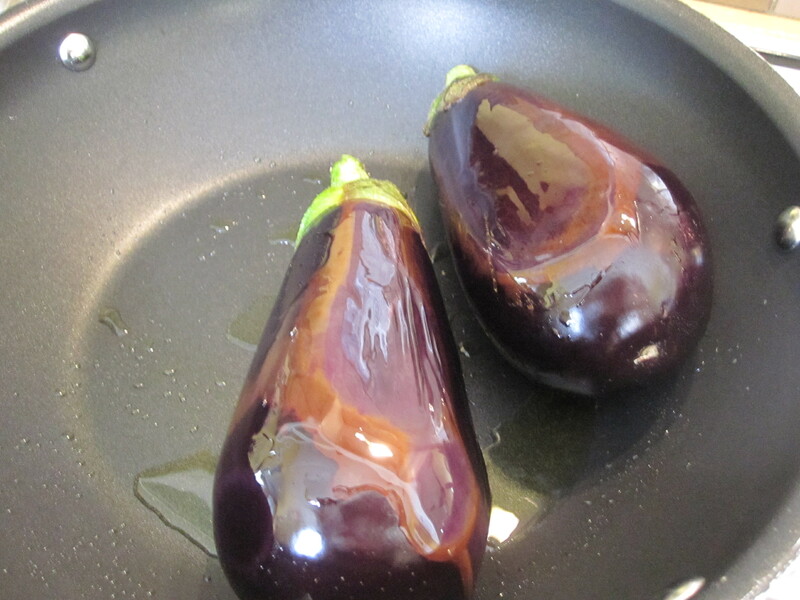 Now heat a little oil in a pan and gently fry 2 aubergines for a few minutes, turning frequently so they become coloured on all sides. Carefully lift them out of the pan and slice in half lengthways. Make a deep slice down the centre of each half from top to bottom and gently pull apart to make a pocket. Now fill the pocket with the tomato mixture. 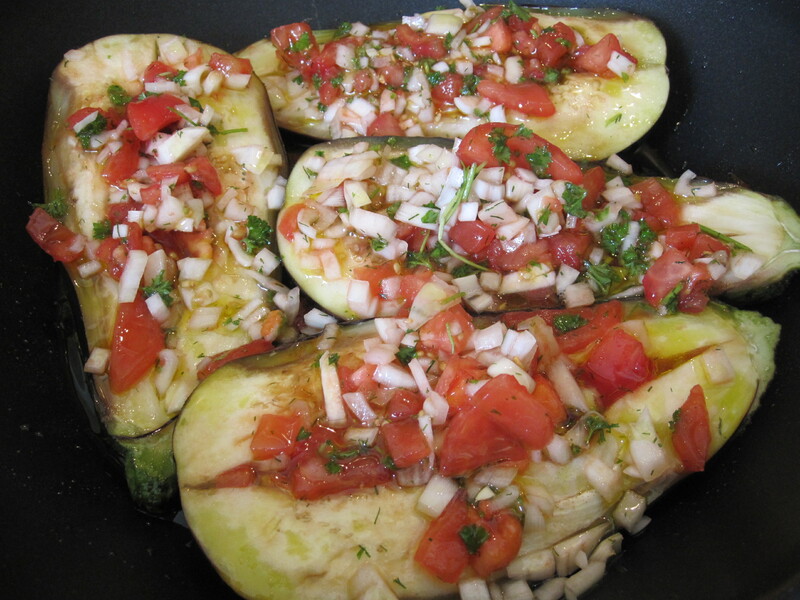 Return to the pan and pour over 6 tablespoons olive oil mixed with 2 tablespoons water and 1 teaspoon sugar. Season the tops of the aubergines with a little more salt and pepper, bring the liquid to a boil and then turn down to a low heat, cover with a lid and cook gently for about an hour – basting occasionally – until the aubergines are soft through and the water has evaporated, leaving just the nice oil juices at the bottom of the pan. Transfer to a serving dish, pour over any oil left in the pan and squeeze over a little lemon juice. Leave to cool. Peel 1/2 cucumber. Slice into quarters lengthways and then chop into smallish pieces. Finely chop 1/4 medium red onion. 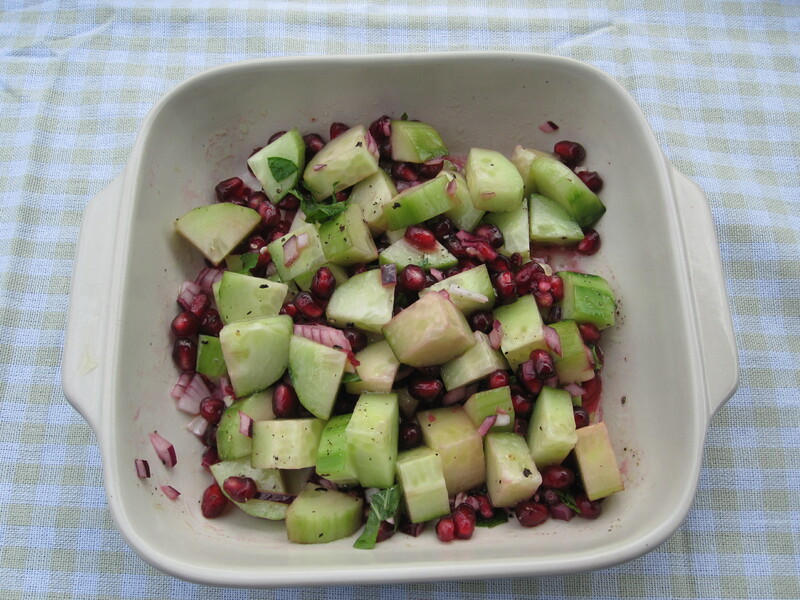 Hold 1/2 pomegranate over the cucumber and onion and bash it gently with a rolling pin to make the seeds drop out. Pick out any bits of the bitter pith that drop in too. Add some roughly chopped fresh mint, a good splash of olive oil and the juice of 1/2 lemon. Season with salt and pepper and turn gently to mix. I also made some lamb koftas using my favourite recipe from Moro East by Sam & Sam Clark. I prepared them ahead of time and then fried them in a little oil at the last moment to serve them warm. I also made some hummus (I always use Simon Hopkinson’s recipe from his Roast Chicken & Other Stories). I had a few French beans in the fridge so cooked them till just tender, poured over a little olive oil and lemon juice, then sprinkled with some roasted sesame seeds. 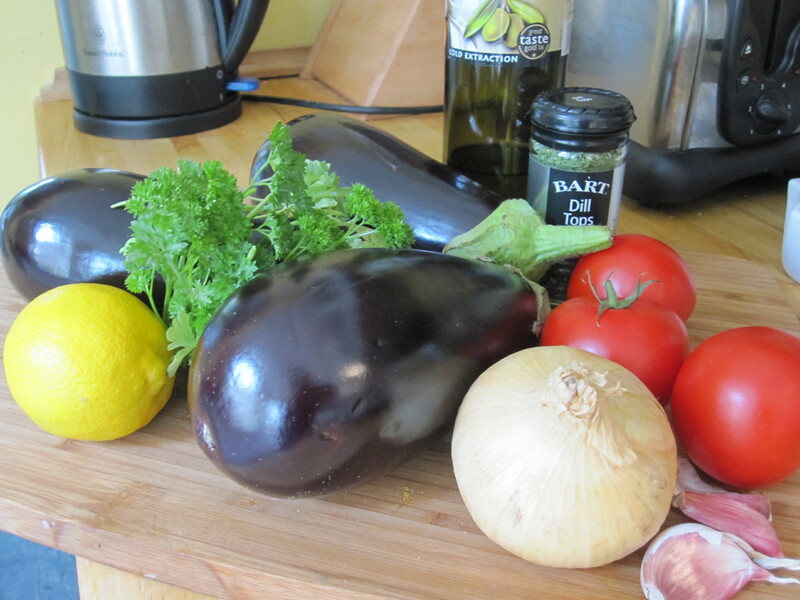 Served with some warm pitta bread, it all made a lovely and summery Sunday supper, perfect for eating in the garden. I just love mezze. What a delicious post!